Sarah, congrats on crossing off this Silver-level competition from your bucket list! I know that shaky feeling all too well, and it’s great that you got credit for all your elements! The IJS scoring system is really confusing, so it’s good you’re able to translate the scores into feedback. And good luck at Sectionals! This is a wonderful start to your IJS journey, Sarah! 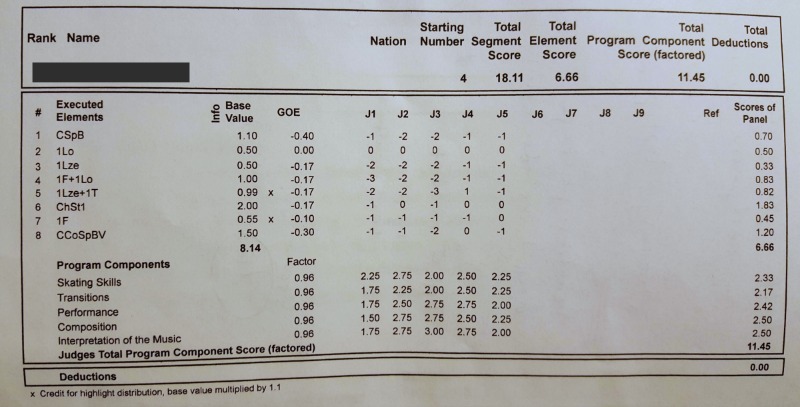 That is a very solid score for Silver. To give you a comparison, in my very first competition (EVER), I skated Gold and received an 18.10. I got several ‘dashes of doom’ for invalid elements, so you’re doing great. What’s great about IJS is that you now have immediate feedback from the judges on the elements that need improvement. Looks like that loop jump is your ‘money’ element. You may want to consider a difficult entry into that or put it in the second half of your program to maximize your score. Good luck at Sectionals! I agree that the IJS is super helpful for figuring out what I need to work on (…aside from everything, I mean) and where they think I’m weak vs. strong. We’ll see how the next set of scores come out. Good luck at your Sectionals too!